Written and directed by series star Patrick McGoohan, "Once Upon a Time" was the first of two episodes of The Prisoner designed to "explain" (more or less) several of the questions posed by the previous episodes, and to bring the saga to a conclusion --- albeit not a logical one. 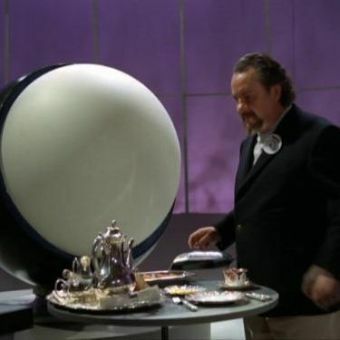 Leo McKern costars as the Previous Number Two, who had supposedly been dispensed with in the earlier episode "Chimes of Big Ben." Returning to the village for one last desperate attempt to "break" Number Six, Number Two utilizes a sinister mind-probing process called Degree Absolute (which was also this episode's original title). Forced to relive all the events of his life, Number Six is plunged into a bizarre netherworld where reality is not even a concept. This time around, the stakes are extremely high, with the lives of both Number Two and Number Six hanging in the balance. When The Prisoner was originally planned as a two-season series, "Once Upon a Time" was supposed to have been the 13th and final episode of Season One. But upon rethinking the series in terms of a single 17-episode season, the script was refashioned as the next-to-last episode; as such, it first aired in England on January 28, 1968, and in America on September 14, 1968.